The time has finally come in our viewing area when almonds get their closeup on Martha Bakes. We taped in September when the harvest was about to begin. Now it’s April, the bloom has finished and green almond season has arrived. This is the ideal time to talk about all things almonds. 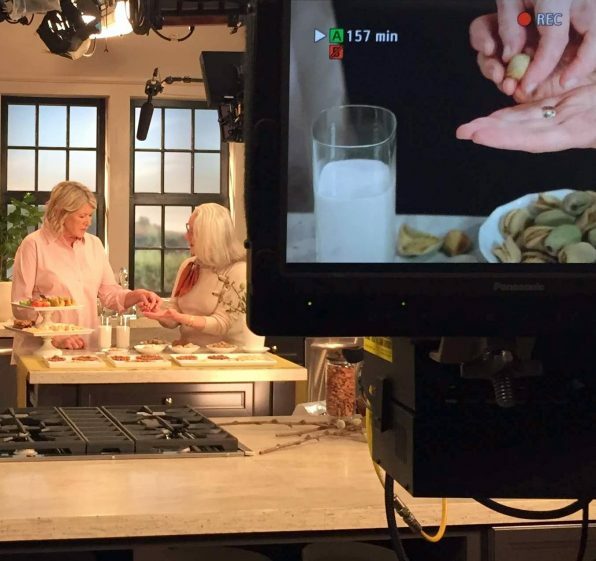 The almond segment appears on Martha Stewart’s PBS Show, Martha Bakes! We’ll be talking about almond forms and the myriad things one can make with almonds sweet and savory. The show airs at 3:30 PM on CPTV this coming Saturday April 6, 2019. The fabulous marzipan fruit you see on screen come from Pasticceria Monteleone on Court Street in Brooklyn, New York. They are my favorite makers of this Sicilian treat and worth the trip. I rushed over to buy some for Martha before the show because I has a suspicion that they would appeal to her as much as they do to me. Spring leading up to Easter is prime season for these confections. I don’t think they ship mail order. If you go, tell them Priscilla sent you. In Italian its pronounced, Pree Sheela!